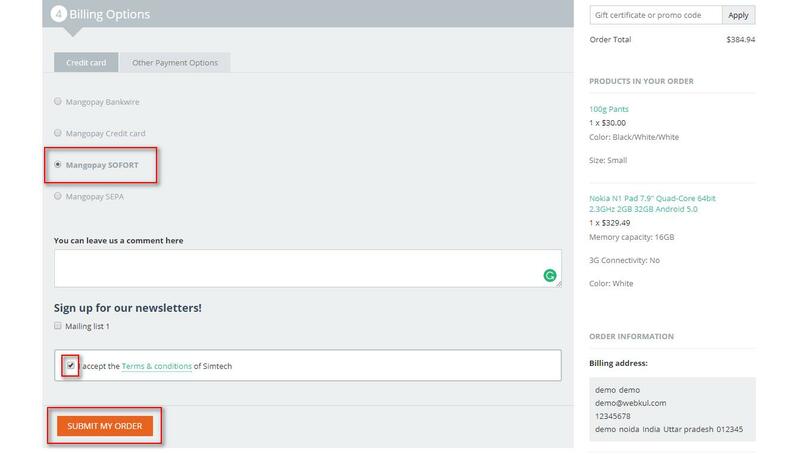 This impressive add-on is a flawless end-to-end payment solution which integrates a secure and reliable payment gateway with CS-Cart Multi-Vendor store. This add-on allows store admin to receive payment from users via Mangopay Payment Gateway. It provides the feature of split payment and bank payout generation among multiple vendors. It enables the platform to accept multiple currencies. Provides the concept of holding the amount in Escrow Wallet on successful order placement. Allows admin to transfer funds from Escrow Wallet to Vendor’s Mangopay Wallet. 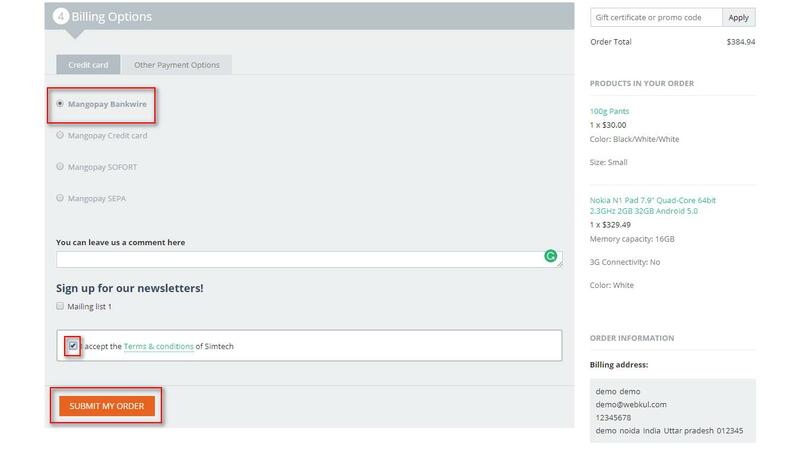 Functionality to manage bank account details at both vendor and admin end. 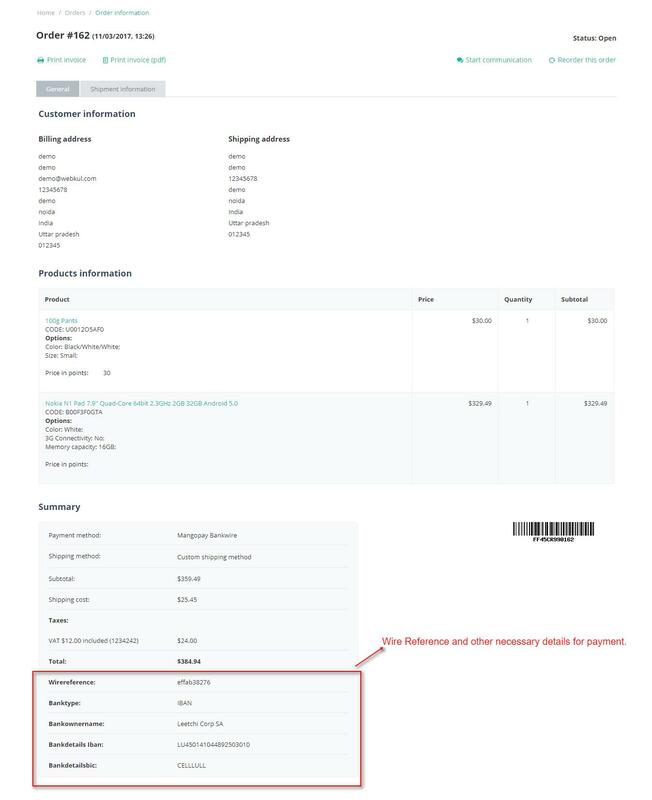 Option to add multiple bank accounts details at both vendor and admin end. Functionality to create a bank payout for vendors at admin end. Option to select the default bank account for bank payout at both vendor and admin end. The payout page will have pre-filled author id & wallet id of associated wallet. No need to enter the same to generate a payout. Functionality to manage KYC details at both vendor and admin end. Option to transfer the amount in bulk to multiple vendor’s wallets. Functionality to send an email notification to admin and vendor for every Bank Payout. Option to delete the transfer and payout logs at admin end. Customer can pay in all supported currencies by Mangopay enabled at the store. Admin can have a wallet for each supported currency by Mangopay enabled at the store. After downloading the CS-Cart Marketplace Mangopay Payment Gateway, you will get a zip file and install.txt. Read the install.txt carefully and configure it accordingly. After successful installation of add-on, click on “Manage” to configure the settings of the add-on as shown below in the snapshot. Mangopay User Id and Escrow wallet id get generated itself once you save the settings. Go to “Administration” -> “Payment methods“ as shown below in the snapshot. Click on “+” to create a new payment method and set the parameters as shown below in the snapshot. For checkout choose the processor as “Mangopay Marketplace Payment Gateway”. Select template as “cc_outside.tpl” from the drop-down. Click on the hyperlink to view the table of supported currencies and cards for Mangopay. Set the order status for successful and failed transactions. Select the type of card for the customer to pay via Mangopay. Set language for frontend panel to pay via Mangopay. To activate the 3DSecure for lower amount transactions from the cards which support 3DS after certain limits, please set the Secure mode field as FORCE otherwise keep it DEFAULT. 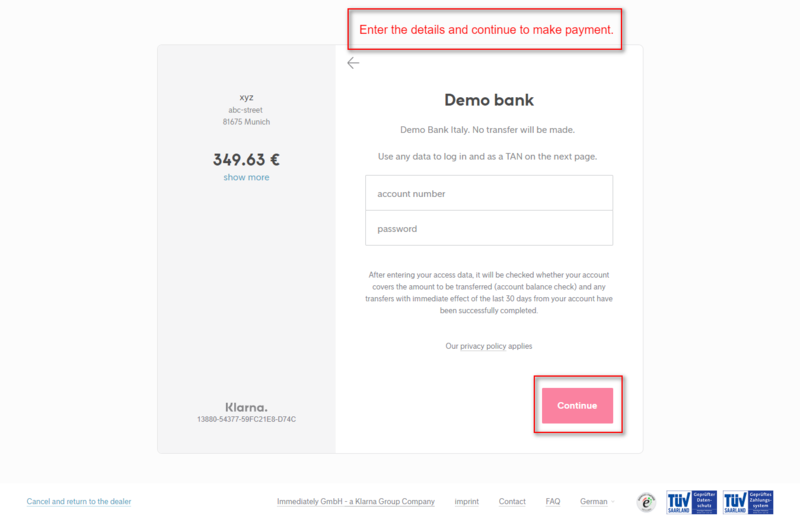 Click on “Create” button to add the payment method. Go to “Administration” -> “Payment methods“. Click on “+” to create a new payment method and set the parameters as shown below in the snapshot. For checkout choose the processor as “Mangopay Marketplace Bank Wire Payment”. Select template as “cod.tpl” from the drop-down. Configure the tabs accordingly as shown above in the snapshot. Set the order status for successful transactions. 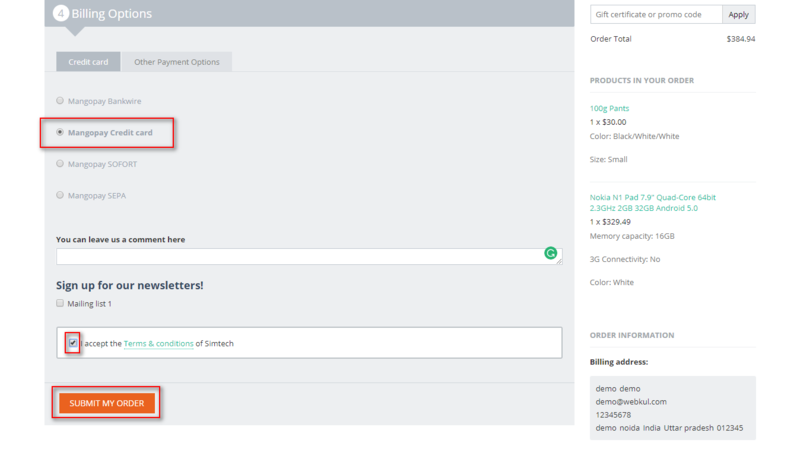 Select the default order status for new order creation. Set the order status for failed transactions. Select the currency which will be converted into default currency for payment If the user selects a currency which is not supported by Mangopay. Click on “Create” button to add the payment method. This is how you can configure Mangopay Bank Wire Payment Method. For checkout choose the processor as “Mangopay Marketplace SEPA Payment”. Select template as “cc_sepa.tpl” from the drop-down. Configure the tabs accordingly as shown in the snapshot above. Further, click on “Configure” for SEPA configuration. While paying through SEPA, a mandate will be generated after entering the bank details. Customer needs to confirm the mandate. Once he/she agrees with the mandate, the Mandate status will be “Submitted“. After the bank verifies the Mandate and everything seem fine at Bank’s end then the mandate status gets “Active“.set the parameters as shown below in the snapshot. Set the order status after Mandate Creation. 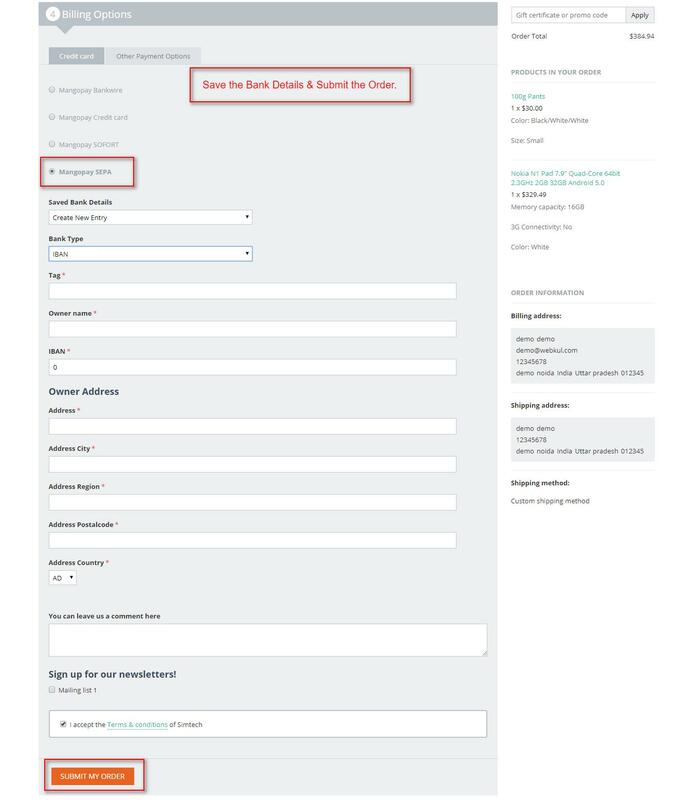 Set the default order status once the Mandate is submitted. Select the default order status for Active Mandate. Set the default order status for Failed Mandate. Select language for frontend panel to pay via Mangopay. Set the currency which will be converted into default currency for payment If user selects a currency which is not supported by Mangopay. Click on “Create” button to add the payment method. 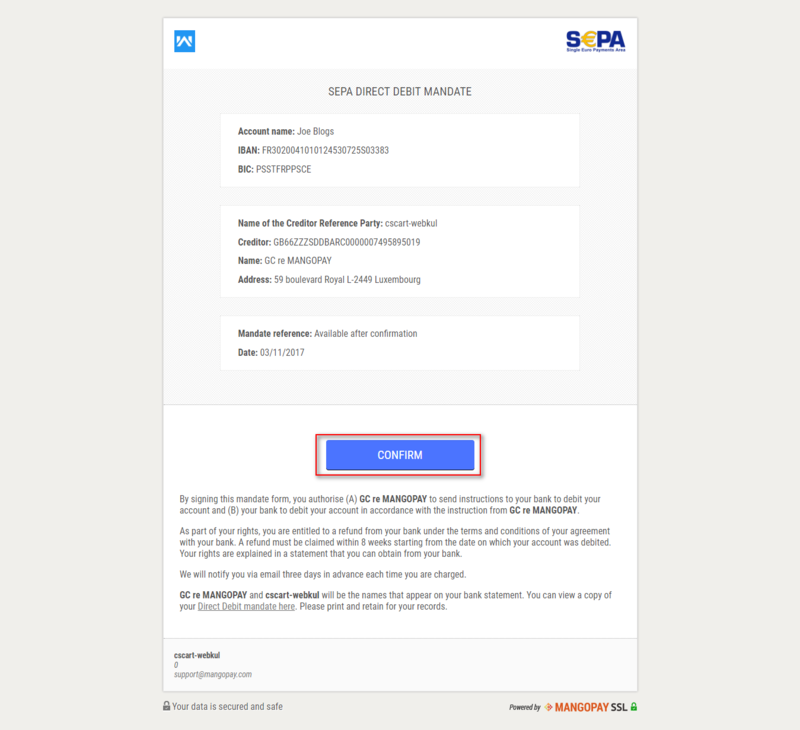 This is how you can configure Mangopay SEPA Payment Method. For checkout choose the processor as “Mangopay Marketplace Sofort Payment”. Configure the tabs accordingly as shown above in the snapshot. Further, click on “Configure” and set the parameters as shown below in the snapshot. Select the currency which will be converted into default currency for payment If user selects a currency which is not supported by Mangopay. Click on “Create” button to add the payment method. This is how you can configure Mangopay Sofort Payment Method. Go to Vendors → Mangopay Marketplace as shown below in the snapshot. Click on “Bank Details” to manage the bank account details. To manage the KYC of vendor click on “KYCs“. KYCs are necessary in order to fight fraud, money laundering and financing of terrorism. Click on “Escrow Account Balance” to manage the Escrow wallet. Click on “Vendor Account Balance” to view and manage vendor’s account. How To Manage Bank Accounts? Go to Vendors → Mangopay Marketplace → Bank Details to view the bank account details of sellers. Click on “+” to add bank details of the seller as per the below screenshot. Set the parameters as per the below snapshot. Select the vendor to add his bank details. Select the type of bank from the dropdown. Fill the bank account details accordingly. How To Upload And Manage KYCs Of Seller? Go to Vendors → Mangopay Marketplace → KYCs to view the KYC details of the seller. Click on “+” to add KYC of the seller. Click to update user information as shown in below snapshot. Set the parameters to add KYC as per the below snapshot. Select the vendor to submit KYC. Enter the name of the document. Choose the type of document. Click on Create button to add the KYC. Once admin clicks to update user information, he/she will be able to view Escrow Wallet and Commission Wallet balance. Id, Email and KYC level will be fetched from Mangopay. To update the user information please set the parameters as shown in the snapshot. Enter the Name and the type of the company. Enter the Legal Person Details, Headquarters Address and Legal Representative Address. Click on Save button to save the settings. How To Transfer Money To Vendor’s Wallet? Go to Vendors → Mangopay Marketplace → Escrow Account Balance. Escrow account balance details can be viewed here by the store admin. Click on “Transfer” button to transfer money to seller wallet. How To Create a Bank Payout? Go to Vendors → Mangopay Marketplace → Vendor Account Balance. Vendor’s account balance details can be viewed here. Click on “+” button to create bank payout for the vendor. Select the vendor for bank payout generation. Choose the sales period for bank payout. Enter the comments if any. Check the box to notify vendor for the payout. Click on Create button to create the payout. This way you can transfer the amount to respective vendor’s bank account. A vendor will be not able to view the Escrow Account Balance as the Escrow wallet is managed by store admin only. Rest all fields are similar for the vendor. Please go through the snapshot for Vendor Panel View. For “Mangopay Bank Wire Payment ” select the option as shown below in the snapshot and submit the order. The order will be placed successfully and the customer will get the wire transfer details to transfer the money in the order details section. Once the payment from the customer is received, the order will be processed. For “Mangopay Card Payment ” select the option as shown below in the snapshot. Submit the order. Enter the card details and click on “Validate” button to make the transactions. For “Mangopay Sofort Payment ” select the option as shown below in the snapshot. Submit the order. You will get redirected to Sofort payment portal. Choose the country and the bank to continue. Enter the bank account number and password to continue. Confirm the payment transaction to place the order. For “Mangopay SEPA Payment ” select the option as shown below in the snapshot. Enter the bank details or choose the saved details. Submit the order. A mandate will be generated for the payment via SEPA. Customer needs to go through the mandate & confirm the same. After confirmation, the Mandate will be submitted at Mangopay Dashboard with the corresponding mandate Id. After the bank verifies the Mandate and everything seems fine at Bank’s end then the mandate status gets “Active” and order will be processed further. This is how Mangopay works for various payments. Thank you for reading. That’s all for the CS-Cart Marketplace Mangopay Payment Gateway, Still, Have any issue, feel free to write here Http://Webkul.Uvdesk.Com and let us know your views to make the module better.